The layout of this card is similar to the card I posted on 3/14 in that it has a panel on the left side and two eyelets on the bottom right. Other than that, I used different colors, different stamps and different techniques. I used faux stitching on this latest creation. It looks like stitching but it's made with a piercing tool and a white gel pen. I love the effect, especially since I don't have to actually thread a needle to achieve it. You can click on the picture below for a close-up view. When I make birthday or anniversary cards for friends or relatives, I make them specifically with that individual in mind. This particular card, however, wasn't made with anyone in mind. I created it just for the sake of creating it. It's always good to have Thank You and Best Wishes cards on hand though, just in case. You know beer well and you'll only drink the best beers in the world. Watered down beers disgust you as do the people who drink them. When you drink, you tend to become a bit of a know it all, especially about subjects you don't know well. But your friends tolerate this because you introduce them to the best beers around. The "watered down" comment is true (well, the people who drink them don't disgust me). You won't catch this girl drinking a Mich Ultra. Good news...my daffodils are fine. The ice didn't kill them. I really thought that they were frozen and that there would be no flowers this year which would have been really sad. The tulips which are planted next the the daffodils are beginning to bloom and I'll be sure to post a picture or two soon. We ate dinner at Schlafly Bottleworks on Friday night. There are two Schlafly restaurants; Bottleworks and The Tap Room. We enjoy them both but tend to frequent Bottleworks more often. The items on the menu are definitely not your typical brew pub fare. I had the pistachio ravioli which is wonderful. The ahi tuna reuben and the salmon are both very tasty too. I always make sure to leave room for dessert as the sticky toffee pudding is absolutely sinful. It's not pudding; it's actually a very dense cake. You can check out the recipe here. The serving is huge and enough for 4 people. It goes without saying that the brews are great too. I had a Pale Ale and a Scotch Ale. My arm is continuing to improve. I haven't taken any naprosyn since Friday morning and I'm not wearing my brace either. There are still little twinges of pain from time to time, but overall, I think I'm on the road to recovery. Well, it did snow today but not as much as the "experts" had predicted. We only received about 2 inches by the time it was finished. The streets really weren't bad so I probably could have gone to work after all. I enjoyed having the day off though. Besides, I have 25 vacation days this year. Much more than I really need! I think my cream color daffodils bit the dust today. It wasn't the snow that did them in; it was the sleet. 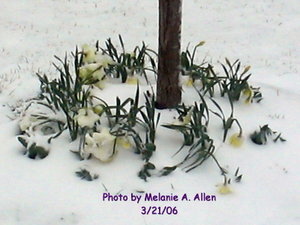 This is a picture of the poor little ice-laden flowers. I scanned a few pictures that I will eventually be adding to my blog. I also started a list of subjects for upcoming posts. Be sure to check back often. I finished the 3x3 note cards I mentioned earlier and I think they turned out great! There is no specific theme or color scheme; just a mixture of birthday, thank you and miscellaneous note cards. I still have to make the envelopes and the little box in which to store them. I'm taking a vacation day tomorrow. It's supposed to snow and my Miata is definitely a three season car. It's actually raining and sleeting right now and the snow has begun to fall about 30 miles west of us. The meteorologists are predicting either 2 to 4 inches or 3 to 6 inches depending on which one you listen to. Right now the streets are already coated with ice and I can hear the sleet hitting the windows. I had to check the calendar just to make sure that it actually is Spring. I bottled my Schwarz Beer today (batch #06-01-13) and transferred it to the carbonation room (aka the office/computer room, which is consistently the warmest room in the house) where it will remain for approximately two weeks. I also transferred my Steam Lager (batch #06-02-14) to the secondary fermentor and it is now lagering in the refrigerator in the basement. This Schwarz Beer (german for Black beer) is the first "repeat" batch. When I brewed it the first time (batch 04-07-07) it was well received by all. While most people think the darker the beer, the stronger the taste, this is not the case. This beer is very smooth and, as the recipe says, "will make a dark beer drinker out of anyone." I was directed to a cute website by a fellow stamper and kitty lover, Michelle L. It's Catster.com and it is just adorable. If you are a cat lover, you have to check it out. The link I've listed will take you to our kitty, Greta. Other kitties can send a request to become friends. Greta currently had 10 kitty friends, none of whom she actually knows. If you visit Greta, be sure to leave a treat for her. Yum! This is one of my favorite cards that I've designed so far. It is a fairly simple design but I find that that is my preferred style. I used the dazzling diamond dust technique which really sparkles and shines, much more than is apparent in this photo. You can click on the picture to see a close-up view. I'm currently designing some 3x3 note cards and will post a picture soon. My tendonitis seems to be improving. Everyone I've talked to who has ever had it said that wearing a brace helps. I've been wearing one since Sunday and it seems to help tremendously...or maybe the naprosyn is kicking in...or maybe it's a combination of both. Is there such a thing? My elbow started hurting about a month ago. It's not excruciating pain, but since it wasn't getting better, I figured I should get it checked out. I finally went to the doctor on Wednesday and told him that I think I have tendonitis. This is also commonly referred to as "Tennis Elbow." Since I don't play tennis, or any sport for that matter, I'm calling it "Stamper's Elbow." Anyway, the doctor agreed with my diagnosis and prescribed naprosyn. I thought, "Cool. This must be some heavy duty tendonitis drug." I went to the pharmacy and had the prescription filled. When I got home, I read the information sheet given to me by the pharmacist and found that naprosyn is also known as naproxen which is also known as anaprox which is also known as ALEVE. He gave me a prescription for Aleve?!!! I can buy Aleve over the counter! Oh well, I've been taking it for 48 hours now and my elbow does seem to be getting better. I just try to forget all of the side effects listed on the information sheet. I might be better off with a sore elbow! We ate at Wildhorse Grill tonight. You can check out the menu at http://wildhorsegrill.com/ The chicken mostaccioli is wonderful. I think I order it almost every time we eat there. We're going to my youngest niece's birthday party tomorrow. She's turning 8 on Thursday. I can't believe how time flies. It seems like only yesterday she was just a baby.